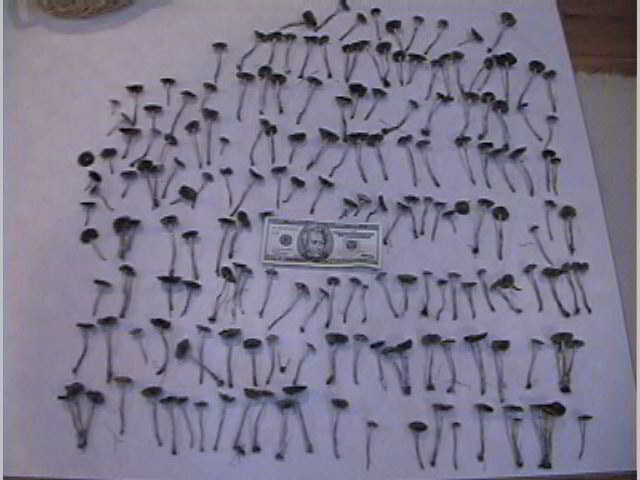 Look at the blue ringers (psilocybe stuntzii) my friend found today right outside his dang ole office building!!! Puget Sound area. From a sod lawn laid within the last year or two. Appeared after the recent deluge rain storm. Left some old ones, also some young ones coming up but the evil lawnmower cometh soon. Its like 200 of em!!! 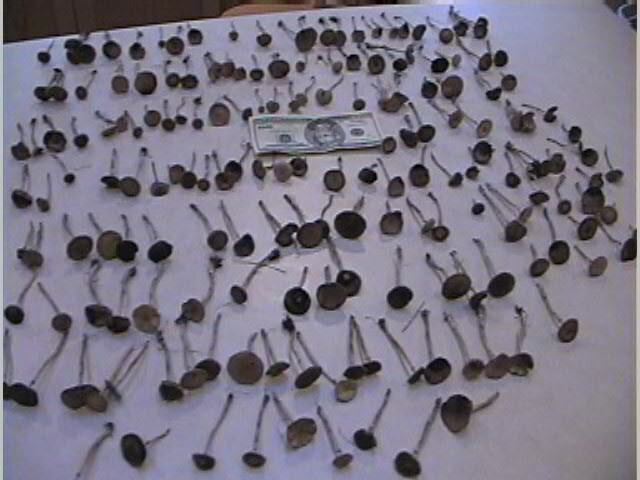 Okay, they are said to be mild potency, but still... My friend has never even come close to a find like this. A few ps. cyans after much efforts is all. This is mind blowing. At his office building were he sits in his cube and works every day!!! Will bio assay possibly this weekend, will follow with potency report. 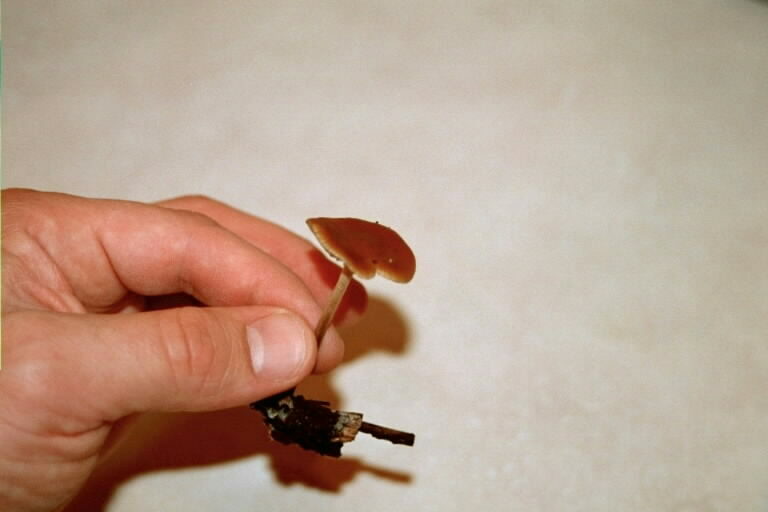 How to tell blue ringers from psilocybe cyanescens? Having seen both, they are very similiar. There are differences but they are quite subtle between some of these ringers and the few cyans I have seen. The rich chestnut brown tone was very similiar, a real signature, but only occurred on some of the ringers. Others were hygrophanous, i.e. dried and tannish, others yet were soggy and dark brown. Cyans may have blue/black veil remant, but ringers certainly have that, every last one of these little buggers, hence the name right? But these ringers did not bruise blue until time passed and it was a subtle coloring. That threw my friend off for a while in making a conclusive ID. The cyans were blue way quick. The ringer stem is also a dingy yellow in some cases, tending to dry to the silky white, while the cyans stems were the lovely silky white from the start. And of course habitat, these ringers were classic lawn habitat whereas the cyans were in bark. But you can find either in either habitat right? Time of year - too early for cyans but still possible. So in the end, if you had ringers and cyans (cyans with decent veil remants) growing together, could you really tell them apart effectively? I bet you can tell'em apart if you find'em at the same time. well stunzii pretty much always has a blue ring formed by veil remains. Cyans never have this. Stunzii and cyans can grow together and one might find an older speciment of stunzii where the veil remains are not visible but that seems kinda unlikely. I think telling them apart is pretty simple. Having found both species numerous times, I don't find it at all difficult to tell them apart. 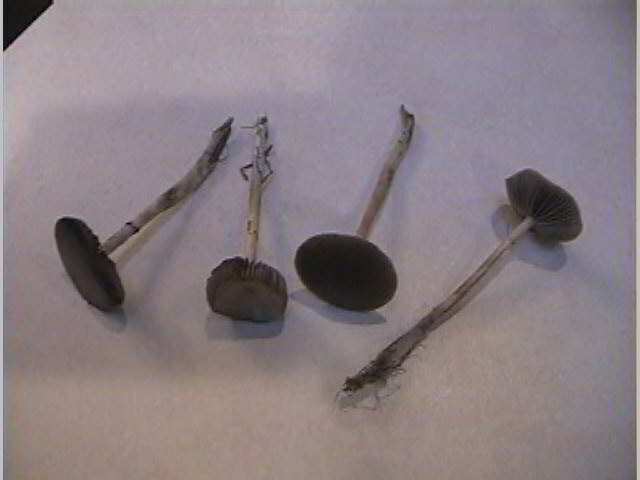 Cyanescens have a distinctive wet-caramel color when fresh, are thicker-fleshed, thicker-stemmed, less translucent around the margin (which shows signs of waviness as soon as the cap starts to open), rarely if ever have a ring on the stem, & blue much stronger & faster wherever touched. Then there's the bioassay test--eat 2 mature fresh specimens. If you get a nice euphoric buzz with interesting visual effects, they're cyans. If nothing happens at all they're ringers. Or you could eat about 40 (not recommended if you can't tell the difference! ): if you get a nice euphoric buzz, they're ringers. If your entire universe is sucked into a 9-dimensional fractal whirlpool which rips your concepts of space, time, & identity to glittering rainbow fragments, each opening out into infinite unfolding spaces of cosmic revelation, you will know when you finally come back that they were cyanescens. The difference of potency among the species is truly amazing. My own experience (with fresh specimens) suggests that 40 or 50 stuntzii = approx. 15-20 semilanceata = approx. 4 baeocystis = approx. 2 cyanescens. Ringers are WEAK but they often make up for it by fruiting in prodigious quantities. Such as your friend found--have fun this weekend! 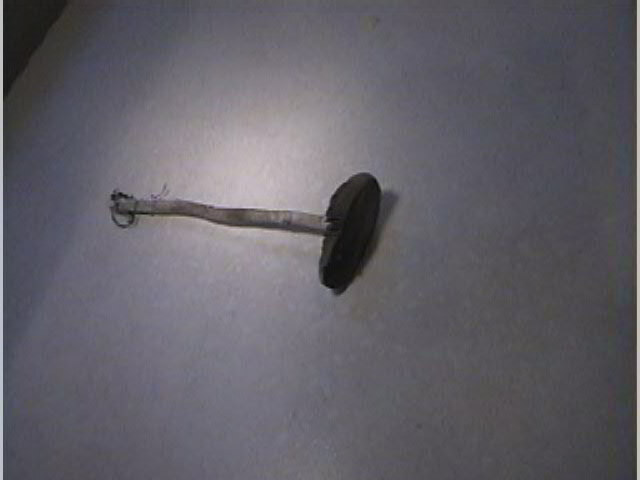 Net dry weight of this ringer find = 30 grams. Stamets says cyans "partial veil copious cortinate, snow white, rapidly deteriorating to an obscure annular zone, if at all." And now that you mention it, there is no ring on this cyan from last fall! Anyway, it seemed as though a few of the ringers had that similiar caramel color to the cyans, I guess that is what made them seem similiar. They sure look about the same dry. Of course, even on the dry ringers you can still see that ring they all have, every single one! So sounds like this weekends dosage should be liberal. Not sure about 40 though, maybe more like 15-20. Thoughts? Are you referring to veil remnants on the Ps. cyanescens species as an annular zone or a "ring"? I'm just wondering if you've found cyans with rings. Yeah, if you're hunting and run across these two species(Stuntzii and cyanescens) in the same day, you'll see the similarities,etc. such as the cap color. Yeah, they are actually very similarly looking mushrooms. It's funny, because one will twist your mind after eating 3+ specimens and the other will only let you know they're magic after a mouthful! 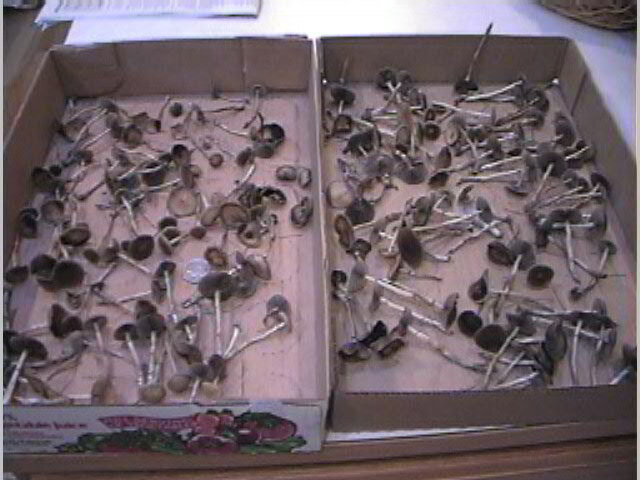 On a positive note: The temps seem to be dropping very fast here, in the PNW, and that means.......................Yep, the shrooms! This time of year is the best!!!!!! For real! Also, nice pics! Good find and I wish you more to come! Many, many more! Edited by Levi7 on 09/07/01 11:52 AM. 2,386 topic views. 8 members, 39 guests and 15 web crawlers are browsing this forum.